– United States Army Corp of Engineer’s Port and Inland Waterways Modernization report. “What we do know is that the world economy is changing, with the pace and scope of these changes accelerating and expanding in unpredictable ways. Shifts in global alliances and political structures, the critical role of emerging technologies, the waxing and waning of the wealth of nations, and even changes to the climate and the natural environment that are impacting agricultural production and the availability of water, are all manifesting right before our very eyes. But that is the challenge – often we don’t pick up the signals that announce many of these changes, nor truly appreciate the significance of the shifts while they are happening or understand the long-term implications associated with these permutations. It is only later, in retrospect, that we recognize some of these changes as transformative “game-changers” to the status quo we mistakenly assumed would continue into the future ad infinitum. In fact, although many now trace the existence of today’s modern container ships to the vision of American truck magnate Malcom McLean, who deployed the first container vessel in the U.S., the converted T2 tanker Ideal X, who among us realized that when the Ideal X carried 58 containers from Port Newark, NJ to Houston, TX on its maiden voyage on April 26, 1956 that we were witnessing the beginning of a revolution in modern shipping that represented a mega-shift in world trade? In his book “The Box,” author Marc Levinson points out that “absolutely no one anticipated that containerization would open the way to vast changes in where and how goods are manufactured, that it would provide a major impetus to transport deregulation, or that it would help integrate East Asia into a world economy that previously had centered on North America. The USACE has a vested agenda in the last clause from the quote above, as the federal agency charged with the responsibility of “investigating, developing and maintaining the nation’s water and related environmental resources.” How the Corps situates the Panama Canal Expansion is of interest to us, as we have been pondering it in a similar manner: observing the emergence of a design singularity that creates a cascade of effects arriving in predictable, unforeseen and networked ways in landscapes around the world. The P.C. Expansion engineering shockwave. 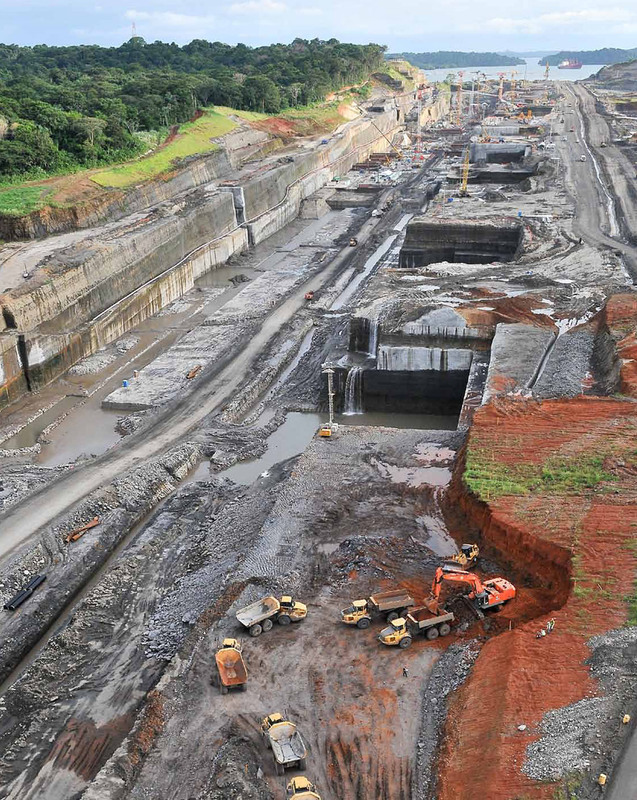 The current earthworks of the Panama Canal Expansion – as monumental and sublime as they are – are rendered somewhat small when compared to the aggregate rearrangement of places and things they will engender far beyond the isthmus. 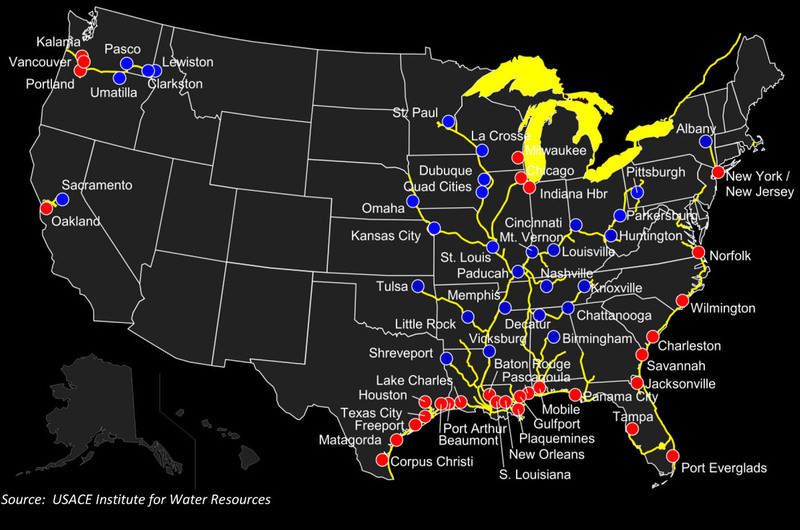 Think navigable rivers in the United States, the depths of which are two-to-four times deeper than they ever were before industrial channel deepening. Or seemingly seemingly unrelated endeavors, like the rerouting of Staten Island’s subterranean drinking water siphon (see below) with a new 12′ diameter concrete water pipe tunneled 100′ below the harbor, the construction of which currently produces 200 cubic yards of excavated dirt per day. And unlike the rather quiet logistical revolution brought about by shipping containers sixty years ago, the singularity of the P.C. Expansion has been analyzed, prognosticated, modeled, and rhetorically conjured into existence, which itself is a sign of just how much the nascent field of “logistics” has developed and expanded in agency since the shipping container arrived. “Measured in geographical terms, the environmental footprint directly impacted by development of transportation system infrastructure is a small fraction of the conterminous United States. But the degree of adverse impact on natural systems and wild species of public interest has been particularly intense and the offsite impacts on air, water and habitat quality from systems operations have been far-reaching. 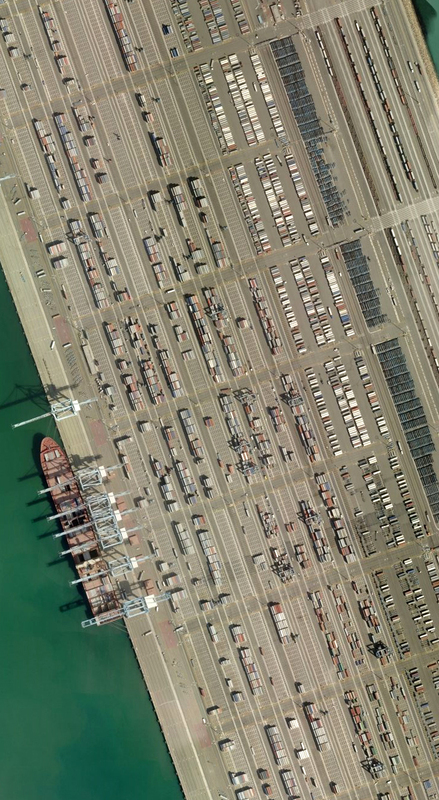 The sources of past environmental effects indicate the type of future modernization impacts that are likely to occur from expansion of harbor, port and intermodal infrastructure and from transportation systems operations. Expanding logistical awareness of the effects of transport infrastructure combined with added foresight to address those effects, shift how those processes coalesce and manifest – what we might call an anticipatory intelligence. 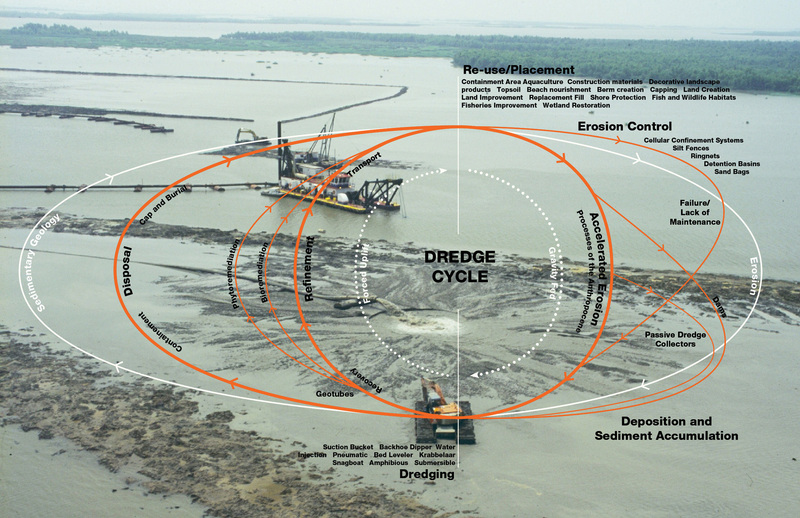 As we’ve discussed elsewhere, the dredge cycle is ever-aggregating, and thus grows ever-more intelligent, circular and responsive by necessity. Likewise, enter the Dredge Act of 2012. This proposed piece of legislation authorizes the USACE to dredge the Mississippi to a depth of 50′ to allow for passage of Post Panamax Vessels through its inland route. This will generate a huge amount of dredge materia,l and accordingly the legislation also mandates that the USACE utilize that dredge to tactically rebuild wetlands in the vanishing Mississippi Delta. This brings the Corps redesign of the river nearly full circle. As the Environmental Defense Fund, The National Wildlife Federation, and The National Audubon Society have remarked, this might not be a perfect system, but it approaches a model that is more holistic and integrative than current operations are. A variety of fascinating design questions then come into play. Where and how to ‘deposit’ that material for maximum collaborative effect with existing water flows, vegetative communities, public participation, and widespread deltaic cuts and other land alterations created by the petro-chemical industries. Perhaps we might see a delta network of Mississippi silt engines generating up to 775 acres of coastal wetlands a year. I wouldn’t mind working on that project. And speaking of dredge acts and events of 2012, the Dredge Research Collaborative is hard at work assembling DredgeFest NYC, which will be held September 28th and 29th. Check back there for more details about the event soon.